If you’re one of the people who receive the weekly newsletter emails from PlayStation then you might want to go check your inbox. 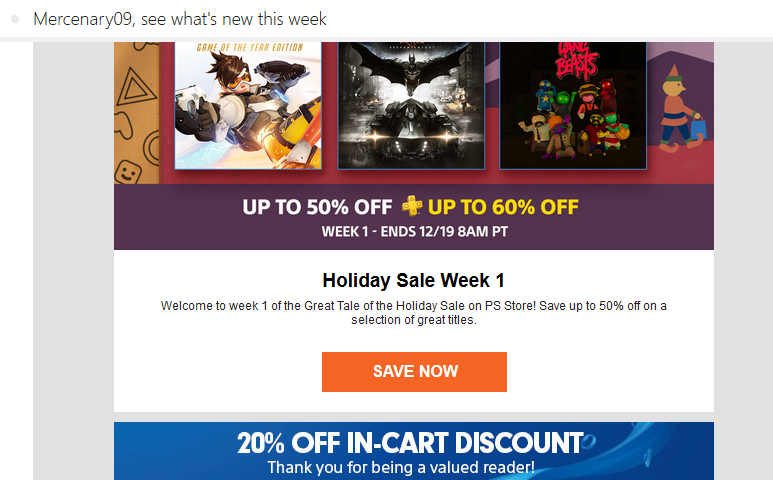 The weekly Friday email this week contains a 20% off coupon for the PlayStation Store for your total cart purchase. This is a great time as Sony is currently running a Holiday Sale on PSN with over 400 deals currently. Week 1 of the sale is running currently but more deals will replace them next Tuesday when the second week of deals kicks off. The coupon is valid until December 25th so you can wait until the next round of deals if you want. Let us know in the comments if you’ll be picking anything up.